What makes a good husband...? Is it being a good provider? Dependability? Supporting a wife in her aspirations and endeavours? Humour and understanding? Being a good listener? The Ladies' Homemaker Monthly, a "turn of the century, US Midwestern journal", claims you can tell a good husband by a contented wife. Well I'll buy that. 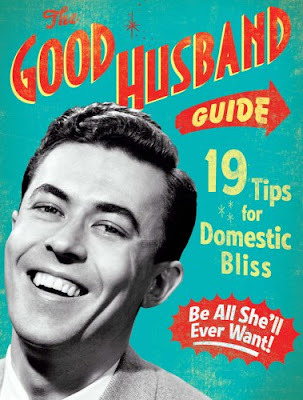 Judging from the book cover of The Good Husband Guide, it's having your teeth bleached and using generous amounts of brylcreem. It's also holding your wife's purse while she peruses the sale rack, being a 'titan of tidiness', looking swish in a pair of seer-sucker slacks, managing to be a cross between John Wayne, Troy Donohue and Cary Grant and providing a daily foot rub for your wife. Dream on. This lightweight, heavily tongue in cheek book offers 19 tips for domestic happiness, though I doubt it'll be men who read it. It's modern fantasy demands in a retro format.